I was so excited when recently Stampin' Up! released something completely new -- something that both beginning stampers as well as seasoned stampers will enjoy! In fact, I was so excited, it brought me back to my college days -- and assignments. Honestly, that is one facet of college life I truly enjoyed: the assignments, especially those that involved research and maybe stepping outside my safe and conventional box. I love being given design parameters to guide me and provide a bit of a foundation, rather than starting from scratch all the time. 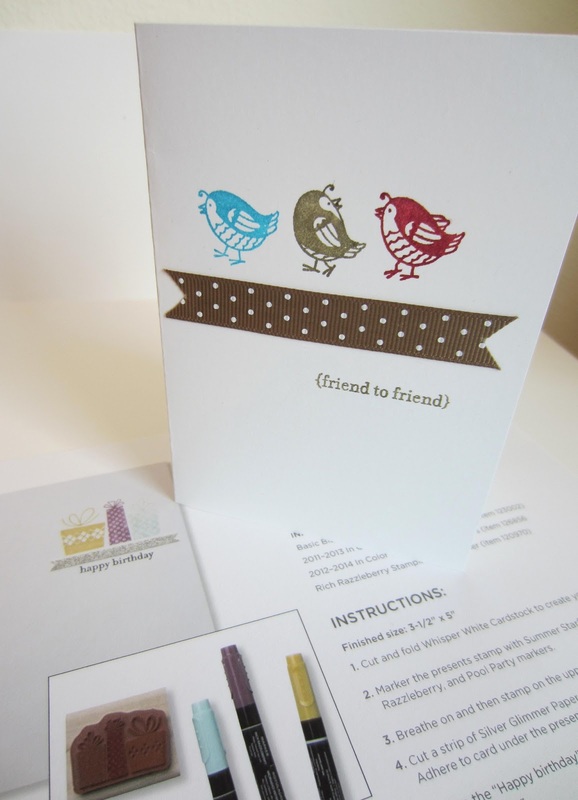 This new item, Stampin' Up! The Basics, is an online class. Really cool. You purchase it (no shipping costs involved since it is not shipped traditionally) -- and then you simply download it to your computer. And -- voila! -- you are all set for some immediate fun! The class consists of six sections that include photos, written instructions and supply lists, as well as several videos that further explain the technique being taught in that particular lesson. There are a total of 34 projects!! The projects begin with -- ahem -- THE BASICS and continuously become more challenging as the lessons proceed. Well, I was so impressed with this simple, reasonably priced download that, rather than tote my laptop down into my work space all the time, I printed out each and every lesson and encased them inside sheet protectors, and put them all inside a nice binder. I am in heaven! Of course, if your computer is located in your crafting space, you can easily work directly from the download. Every day without fail I head down to my workshop and do ONE of the lessons. 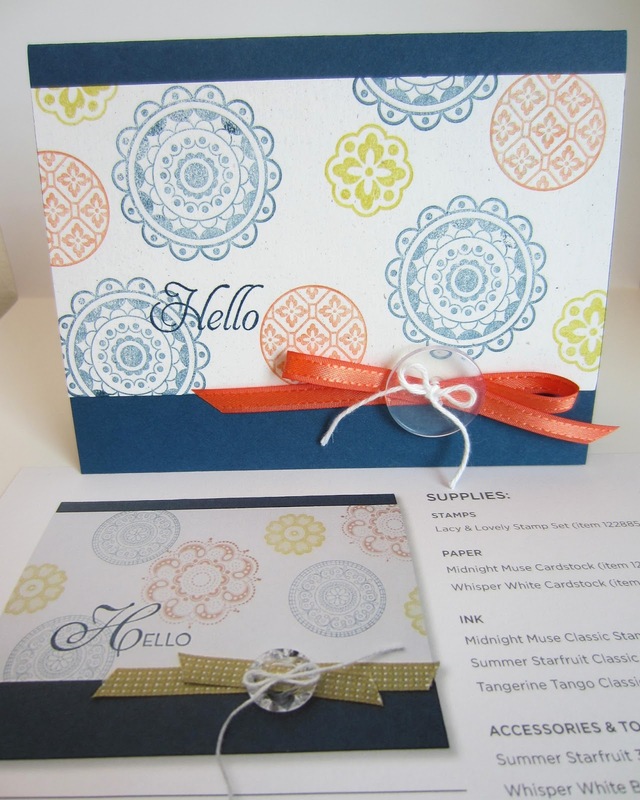 At first, I thought I would reproduce each project as Stampin' Up! designed them. However, after I finished the first lesson and proceeded to Lesson 2, I discovered that would not be possible. Of course, I do not own all the products they were requiring to recreate them faithfully. Oh well. A good opportunity to spread my wings a bit and make them completely my own! I have to date completed eight of the lessons. And I am having a wonderful time! Although I am using some of the components called for, often the color palette, I deviate quite a lot. Of course, I am always faithful in concentrating on the "lesson" of the day, the technique being covered. Anyway, I thought it would be lots of fun to share some of this experience with you, my readers. Each time I do a blog post on what I've accomplished thus far, I will include photos and explanations of four of the projects. What you see in the background of this photo is the first page of the online class as well as the initial project. As is obvious in my card, I copied the sample exactly. It is a darling 3" x 3" card, and, of course, very simple to make. As I previously said, it is so easy to switch up some of the supplies from what is called for to something similar that you already have in your paper crafting arsenal. I'm not sure if you can pick up from the photo that project 2 was built upon a lunch sack. While it is adorable, I opted to do only the "technique" portion of the lesson and created mine as a bookmark. It features the popular ombre effect, and was fun and easy to do. In this project, I was missing several of the components. I substituted the Circle Circus stamp set; used a different "Hello"; replaced the Summer Starfruit ribbon and the way they tied it for some of the Tangerine Tango ribbon I got for free through Sale-A-Bration (still going on until March 22!!! ); and, since I could not locate the gorgeous clear vintage buttons I had purchased to make the cover ornament from the Holiday Catalog http://www.paperseedlings.com/2012/09/cover-ornament.html I decided to use some of the clear buttons I had purchased from Stampin' Up! years ago. I am very happy with the result. I did not have the cute row of presents stamp, so I incorporated a much UNDERUSED stamp set that is now retired and did the assignment. I also replaced the strip of Silver Glimmer Paper with a piece of the retired Soft Suede polka dot ribbon. I obviously used a different sentiment also. All in all, I think it's a pretty cute card. 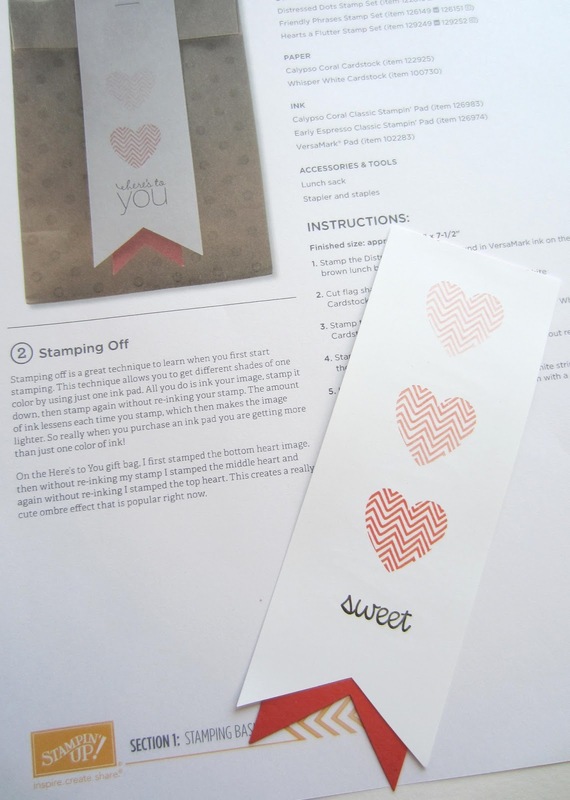 This $14.95 class, ideal for either novices or seasoned stampers to learn something new or brush up on an oldie but goodie, is so totally worth the money. It gives me something to look forward to for 34 days, That's more than a month of daily inspiration. How many other things you can purchase for $14.95 can give you so so so much pleasure?? Give it a try! You will not regret it. Hmmm, sounds like something I need. I want to learn to make cards as nice as yours! It does sound like a good idea too. Oh how cute Linda! I know that it would fun to have a tutorial to help us get past the mind block or brain fog that gets in our way, but for a new papercrafter this would be so nice too! Of course a stash of supplies to get started with would be good to add as a gift...maybe for graduation. A thank you stamp!! Too cool! Thanks for joining me this week!! Wow! What a great idea & I love how you freed yourself from the computer by printing everything out. I have never actually held a stampin' it up product in my hands, but you make it look so wonderful! I'm glad I popped over here from Consider Me Inspired today! Love your projects. Thanks again for sharing with us at "In and Out of the Kitchen"
Hi Linda new follower! Hoping to learn some tips from your blog. I do a lot of paper crafting but shy away from stamping. Everytime I stamp I get an inconsistent coverage of ink. I have tried various inks, different types of stamps etc. This looks great. I'm looking forward to more. What a fun concept! I was a SU demonstrator for several years when my kiddos were really little. 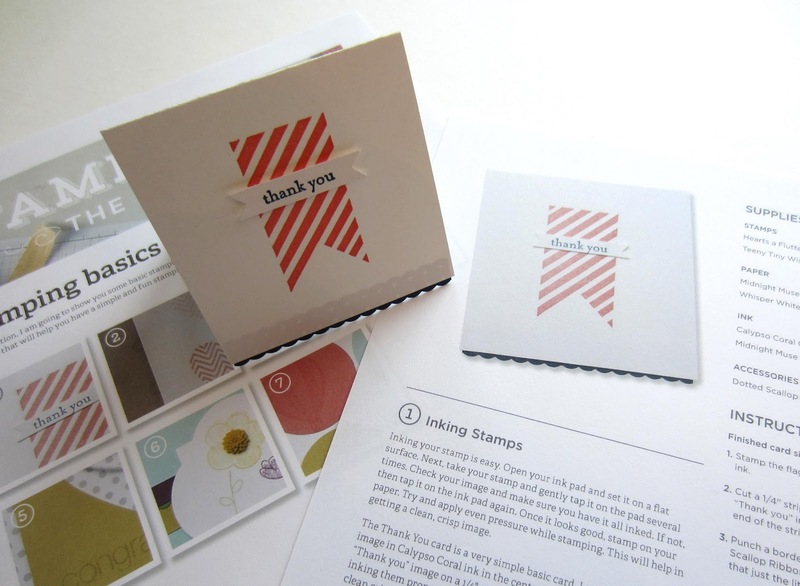 I still love the creative process of stamping cards. Thanks for sharing this! Your cards are always so delightful. You have a real flair for this type of work. Thanks for sharing. These are so cute! Thanks for sharing on Domestic Superhero's Thursday Link Party! Hope to see you again this week! These cards came out great. Thanks so much for sharing with Wednesday's Adorned From Above Blog Hop. Have a great week. What an awesome service! I LOVE SU products so bonus! Thanks for sharing and linkin up to Sunday FUNday! How fun! Thanks for sharing this on The Creative HomeAcre Hop!